A gremolata is, classically, a garnish for veal osso bucco made from equal parts lemon zest, parsley, garlic, and olive oil, plus salt to taste. For a twist, we made one with equal parts orange zest, pine nuts, and chives, plus sea salt and ground pink peppercorns to taste. 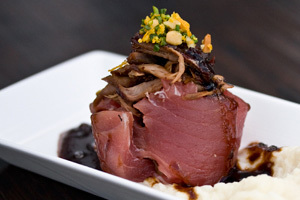 It paired perfectly with the veal osso bucco stuffed sashimi tuna in the 21st Century Vitello Tonnato recipe.